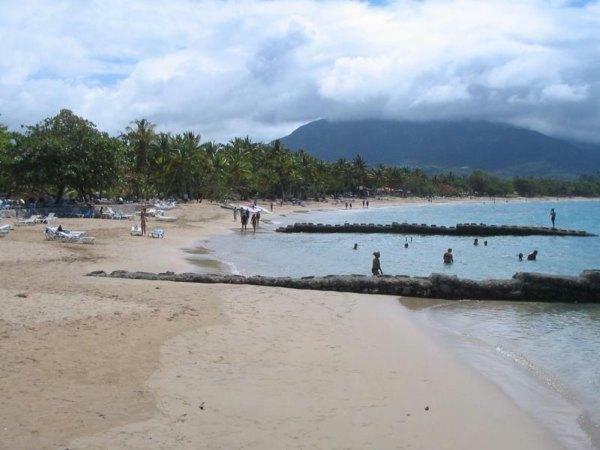 Playa Dorada Beach is located in Puerto Plata on the Dominican Republic north “Amber Coast”. Amber was actually discovered here. This is one of the Dominican Republic’s most established resort areas. The newer resorts are in La Altagracia, Punta Cana. 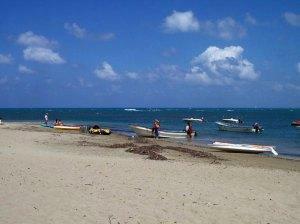 Playa Dorada Beach is a great area as each of the resorts here have their own piece of the beautiful, beige beach. There are some nice reefs here, as well. Just offshore, and even close-in along the strand, you’ll find some of the best snorkeling on the north shore of the Dominican Republic. The Ventana Beach Resort is on one end of the hotel area. From there, you can see right up the Playa Dorada Beach with a spectacular vista of the region. This ocean here makes for great windsurfing and kiteboarding. Some water skiing can be found, however, ocean waves make skiing tiresome. Remember that the “Amber Coast” faces the turbulent Atlantic – water can be rough. Another thing to note about the area is that it does rain a lot during the winter months. Because this coast is well developed, it can get crowded. Sand – powdery white to beige, coral/rock based. Facilities – full along the strand. Sports – many kiosks dot the beach. Notes – can get crowded with locals and tourists. Try Luperon Beach to the west for relief. The beach is just wonderful and food close by, so plan on spending a day or even two in this area. The countryside is marvelous and this area of Dominican Republic is highly recommended by us. You won’t go wrong booking here.